Overnight, gold traded either side of unchanged in a narrow range of $1301.70 - $1306.80, but retained its choppy tone. It softened early during Asian time to its $1301.70 low as the dollar moved higher (DX from 93.75 – 93.90) off some conciliatory remarks from North Korea, after Trump cancelled the summit scheduled for 6/12 yesterday (“we have the intent to sit with the US side to solve problem regardless of ways at any time”). Comments from the China’s Foreign Ministry that they would “continue in our own way to carry out US-North Korea work so as to promote the resumption of the dialogue process”, along with news that Commerce Secretary Wilbur Ross would visit China from 6/2-4 for another round of trade talks also weighed on gold. The yellow metal rebounded during European time to $1306.80, where it was capped by resistance at yesterday’s high as the DX dipped back to 93.75 - pressured by a temporary recovery in the euro ($1.1685 - $1.1734). However, ahead of the NY open, the common currency plunged to $1.1662 (rising Italian bond yields, political instability in Spain), and the DX was pushed up to 94.18. 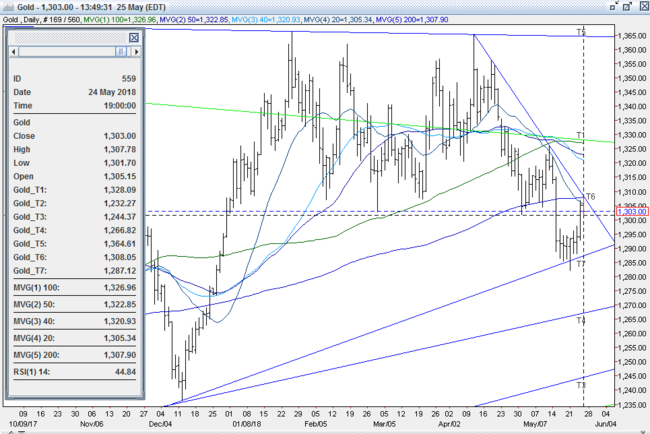 Gold dipped lower, but support ahead of $1300 held. A continued softening in the US 10-year bond yield (2.946%) was gold supportive, but mostly higher global equities were a headwind. The NIKKEI rose 0.1% ,the SCI fell 0.4%, European markets rose 0.2% - 1.1%, and S&P futures were +0.3%. A continued decline in oil (WTI plunges to $68.99, Russia and OPEC considering easing production limits) weighed on stocks. At 8:30 AM, a worse than expected headline reading on US Durable Goods (-1.7% vs. exp. -1.3%) knocked down S&P futures (-11 to 2716), sent the 10-year yield to 2.922% (fresh 2-week low) and drove the DX back to 94.03. Gold took out its overnight high at $1306.80 to reach $1307.80, but was capped by resistance at the 200-day moving average at $1308. Shortly thereafter, Trump made some conciliatory comments on North Korea (“good news to receive warm and productive statement from North Korea…we are talking to them”, and suggested the summit could even still be held on 6/12). This, along with a focus on some positive components to the Durable Goods report (ex trans and capital goods shipments non defense ex air beat strongly) abruptly turned markets. S&P futures rallied back to unchanged, and the 10-year yield rebounded to 2.942%. The dollar took out Wednesday’s 94.19 top to make a fresh 6-month high at 94.25. Gold was knocked lower to $1302.50, but bargain hunting bids emerged in front of the key $1300 support level. US stocks drifted lower into the afternoon (S&P -11 to 2716, with energy and financials weighing), hurt by a further pullback in crude (WTI to $67.50, Baker-Hughes Rig Count +15). The 10-year yield ticked down to 2.929%, and the dollar pared gains to trade 94.12. 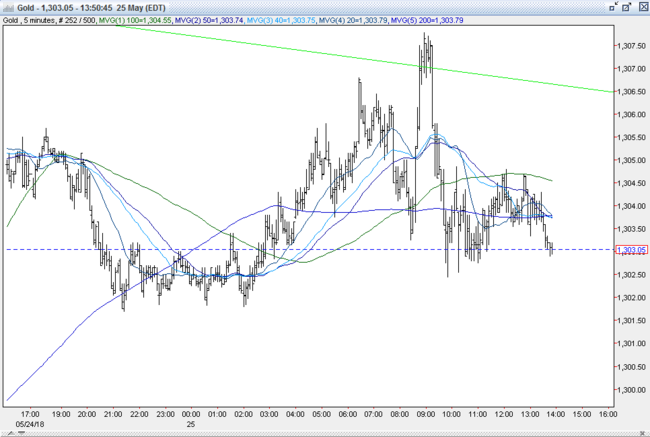 Gold worked higher, and traded up to $1304.75. Open interest was off a whopping 17.6 k contracts, reflecting a heavy amount of short covering (but also some profit taking from longs) from yesterday’s advance. Volume ballooned with 549k contracts trading, inflated by the June-August spread. All markets will continue to focus on the volatility in the equity and bond markets, geopolitical events, developments with the Trump Administration (especially on US-China trade), corporate earnings, oil prices, and will turn to this afternoon’s Commitment of Traders Report followed by reports Monday on German Retail Sales and Japan’s Jobless Rate for near-term guidance.